Originally posted: December 13, 2017 . Last modified: December 16, 2018 . 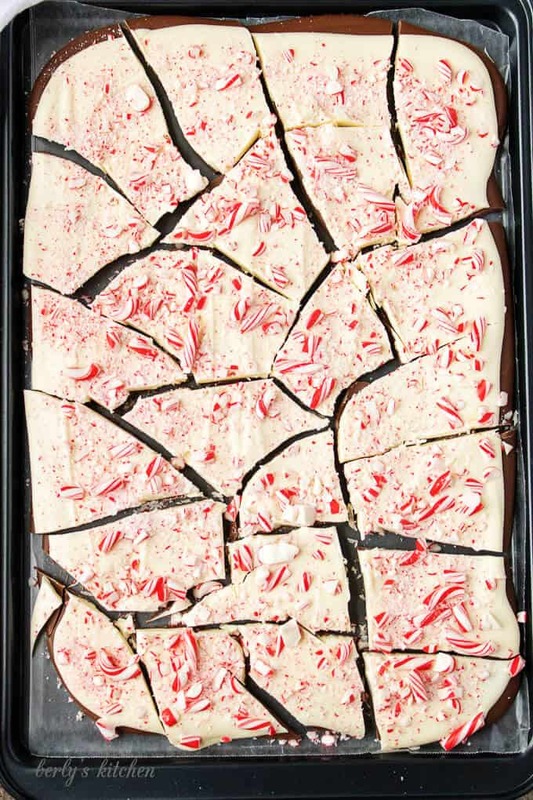 An indulgent homemade peppermint bark recipe loaded with smooth, creamy milk chocolate, decadent white chocolate, and brisk peppermint candies. Who doesn’t love seasonal candies? They take the best flavors and combine them to create sweet, sugary treats. 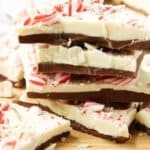 For example, this peppermint bark recipe fuses the fresh zing of candy canes with two kinds of rich, luscious chocolate. In less time than it takes to go to the store and buy a sweet snack, you can prepare this recipe at home. All you need are four ingredients and microwave-safe bowl to get started. First, gather your ingredients, the milk and white chocolates, the peppermint candies, and the peppermint extract. Now, line a cookie sheet or sheet pan with wax paper and set it aside. Next, in a microwave-safe bowl, melt the milk chocolate on half power. Use 20-second intervals and stir the chocolate between each interval. Then, stir in 1/2 a teaspoon of peppermint extract and evenly spread the chocolate mixture on the wax paper. Place it in the fridge for at least 30 minutes to firm. Go ahead crush the peppermint candies while you wait. 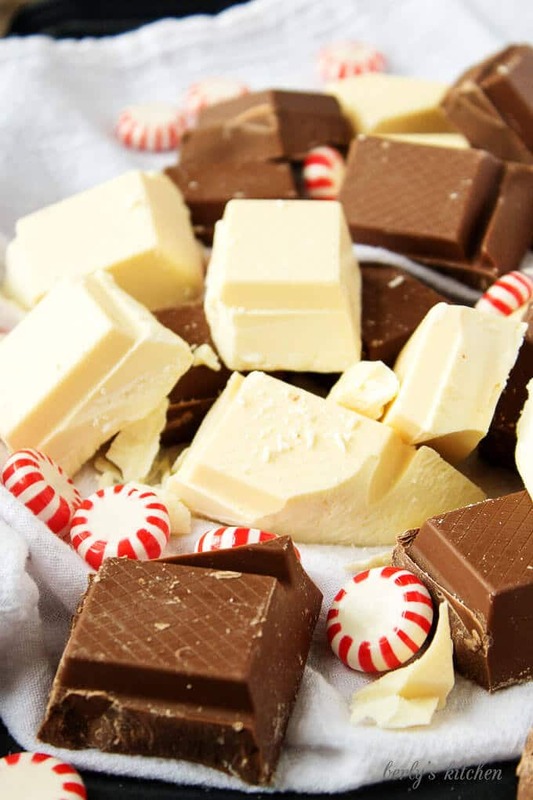 Afterward, repeat the melting process for the white chocolate and add the rest of the peppermint extract to the white chocolate. Spread it over the cooled milk chocolate layer. While the white chocolate is still warm, evenly sprinkle the crushed candies over the top layer. Place the pan back in the fridge to cool for at least 30 minutes. Break the bark apart into pieces for serving. Make sure you stir the melting chocolate every 20 seconds to prevent scorching. Also, it can be made in advance and frozen, but expect the chocolate to discolor over time. Drop a piece of the bark into hot milk for peppermint flavor cocoa. 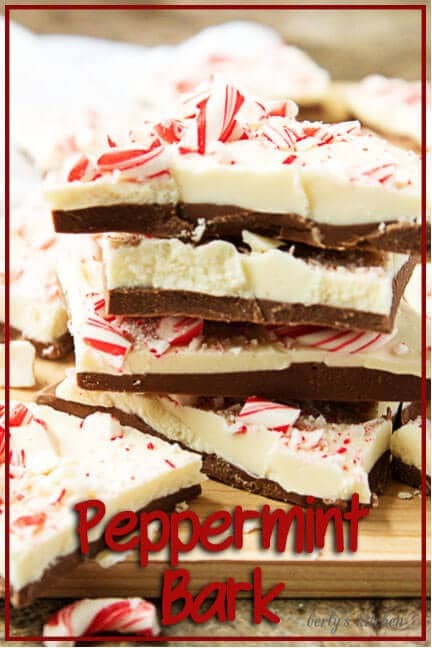 Pick up some candy bags from the craft store and make this peppermint bark recipe as simple homemade gifts. Looking for other holiday treats? 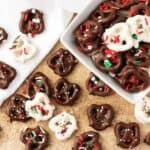 Then take a look at our Chocolate Covered Pretzels Recipe or our Mint Chocolate Fudge! First, line a sheet pan with wax paper and set it aside. Next, in a large microwave-safe bowl, melt the milk chocolate on half power for 20-second intervals. Stir between each interval. Then, mix 1/2 teaspoon of peppermint extract in with the milk chocolate and spread out the mixture evenly on the wax paper. Set it in your fridge for 30 minutes to firm. Afterward, melt the white chocolate in the microwave, just like you did the milk chocolate. 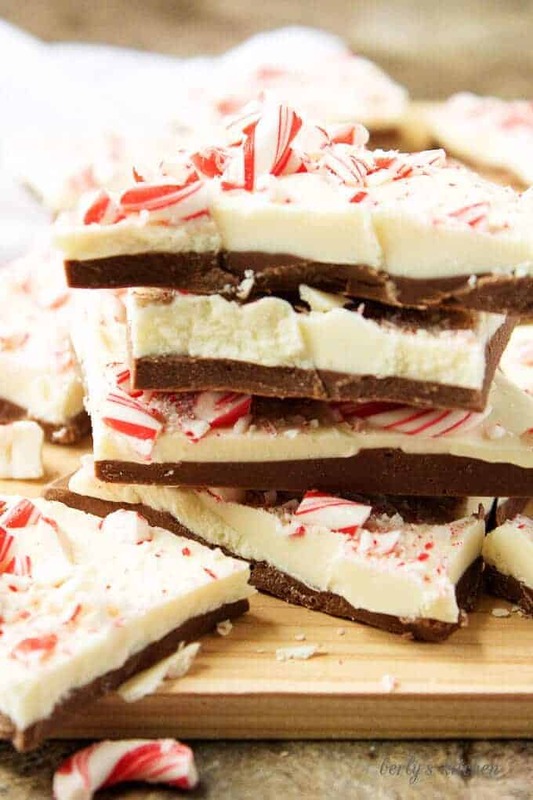 Stir in the rest of the peppermint extract and spread the white chocolate over the hardened milk chocolate. 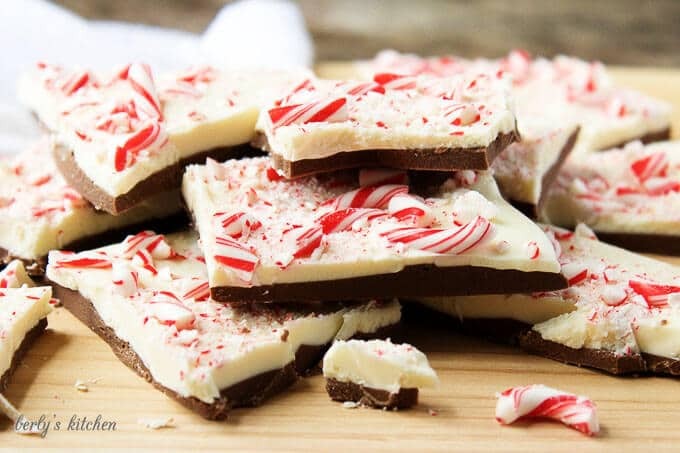 Last, crush the candy canes and sprinkle them over the white chocolate and place the bark back into the refrigerator to set (about 30 minutes). After the candy sets, remove it from the refrigerator and break it into pieces. Store in an airtight container for up to 3 days. The calories listed are an approximation based on the ingredients and three pieces of candy per serving. Actual calories may vary. 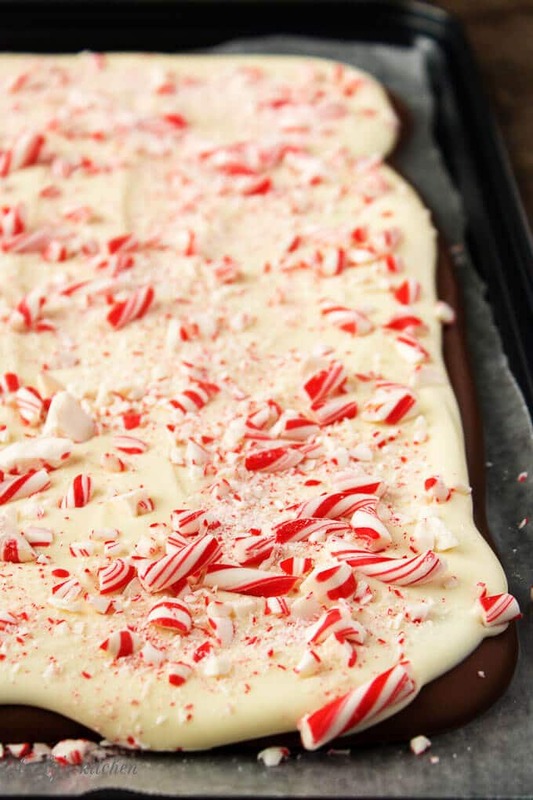 The peppermint bark can be stored in a sealed container for up to three days.